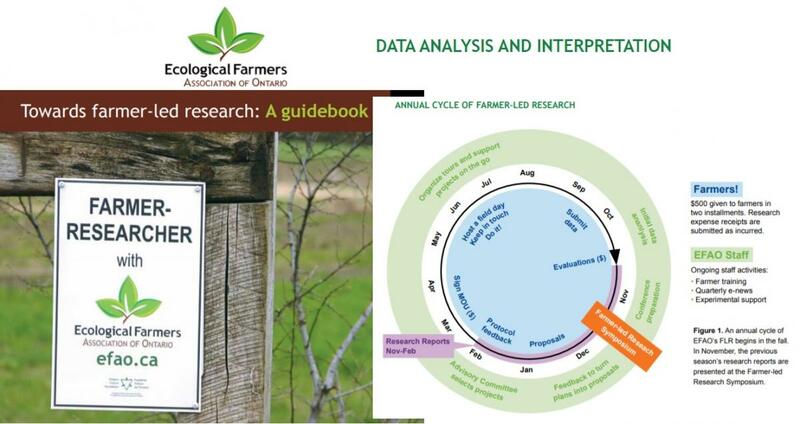 The booklet Towards FARMER-led RESEARCH: a GUIDEBOOK - published (2018) by the Ecological Farmers Association of Ontario (EFAO) - aims to provide you with support to work together with farmers in research. 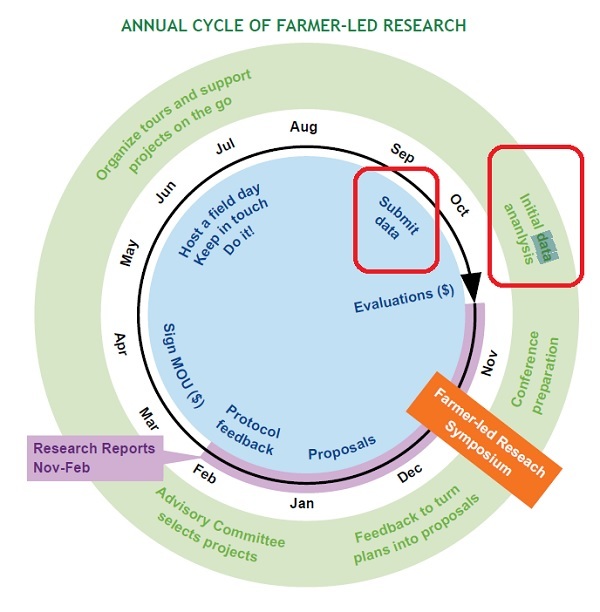 offers a practical tool for researchers and practitioners seeking to develop, implement and evaluate Farmer-Led Research Programmes. is an approach that empowers farmers to COLLECT DATA for their own farms while collaborating with scientists. – to meet the diverse needs of different farmers. In this way, FLR leads to innovation, builds local capacity and supports livelihoods through better productivity, nutrition and household income. A funding program in the United States called Sustainable Agriculture Research and Education (SARE) that provides funding for farmers to conduct research on their own farms. Based on DATA, agricultural non-profit organizations like EFAO and PFI also focus on farmer-to-farmer knowledge generation and sharing. Through this approach, member-farmers are connected to the environment and each other. FLR… AND DATA: WHY DOES IT MATTER? *** Farmers more than any other profession understand that each year is unique in its own way. Weather and many other unknowns (e.g. neighbour’s practice) often provide unexpected challenges to the farmer and farmer-led research. For this reason, farmer-researchers are called for more multi-year trials, because including multiple growing seasons increases the APPLICABILITY of the DATA. *** Like multi-year trials, multiple farms researching the same question increases the APPLICABILITY of DATA and scope of the findings, especially for geographically diverse provinces. *** In addition, multi-farm trials hold farmers socially accountable, knowing that other farmers depend on them to finish their project to the best of their ability and DELIVER DATA on time. *** At the end of the trial season, farmers are supported in the CONSOLIDATION and ANALYSIS of their RESEARCH DATA. The FLR Program helps ensure that proper interpretation of results (i.e. statistical relevance and practical significance) is consistent, and helps farmers write and publish reports. EFAO provides a diversity of capacity development, including how to formulate a research question, how to design a research protocol, training in statistics and DATA INTERPRETATION, and how to communicate and ‘tell your story’ based on data to others.